Despite the joy of having Baby B in my life, I don’t deny it is very demanding taking care of a baby. I, in fact, any mother would agree that sometimes we need a little time of our own. At least to have a nice, decent shower without having to rush through it or having a meal and really enjoying the food. Did I mention some time to spend with my BFF? Initially, I felt guilty for wanting some time of my own. I dedicated 25 hours a day for Bella. Yes, 25 hours!! Until one day, my husband told me to slow down. He worried I might burn out by doing so.. He was the one who asked me to go out with my friends and leave Bella with him.. Well, at the same time, he wants to spend some daddy-daughter time with Bella. He tries to bring Bella out without me (without me!! OMG!!) at least 1 hour every day to give me a break and for him to bond with Bella. He doesn’t want Bella to be too clingy to me.. Come to think of it, maybe he doesn’t want me to be too clingy to Bella 😉 Hehehhe.. 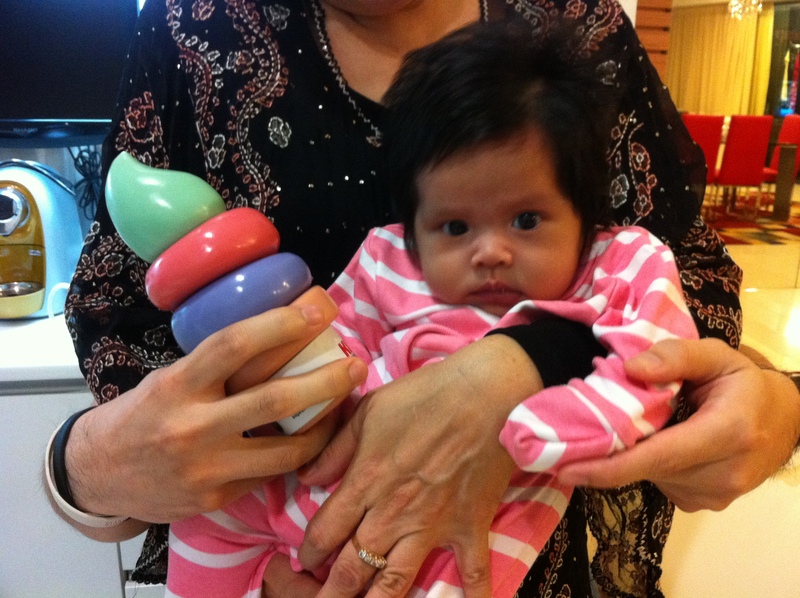 So, mommies, take good care of yourself because you are the one who is taking care of the rest of your family.. Owh, the picture shown was Bella ‘holding’ daddy’s Favourite Idol award the he won during TV3 Kids Award last Sunday..
Posted on September 28, 2011 November 1, 2012 by Dr Halina Mohd YunosPosted in MommyhoodTagged whatever. Hi doc. I just can’t agree with u more. My son is 1 1/2 years old now. 6 more months to achieve my target in my fully breastfeeding phase. The first 12 months of my baby’s life, my husband and i were in long distance r’ship. He was in KL while I was in Terengganu. My life was so tough, handling my little man, my father who was sick that time plus my alzheimer stepmom. But thank God, everytime he comes home, he would ask me to have a break, go out with friends, etc. Now he’s already here working from home, i think he spends more time with our son than I. Anak teruna cari mak bila lapar susu, nak tido, nak makan. Tapi suka tengok mcm tu, sebab memang patutnya anak teruna kecik tu rapat dgn kami dua2, not either one. Never. And yessssssss.. mommies, take a good care of ourselves, kalo kita sakit, sape nk jaga kesayangan2 kecintaan2 kita tu. Personal time is important for mothers, new ones especially. It helps to reduce the risk of resentment towards the child and spouse and also post natal blues. If you don’t get enough rest, then taking care of the child leads to exhaustion and brittle temper. It is safer all round if you get your “me” time. haha.. halina, dulu i mkn slow gile.. with 3 kids jd laju gila.. mandi mmg dah bertthun mandi dgn lajunya.. my husband pun sebok jg.. yes, we need some time for ourselves.. i have no maid.. semua kena buat sendiri.. and now mmg letih gile.. everytime i put my baby to sleep, for sure i pun hanyuttttt.. i wish i can be a housewifeone day..
chosen one to truly work the spiritual world in helping all those whose work was never done by other healers and completed. 72 hours. This is your day. 9. Help with the use of a spell charm to bring back stolen goods. 10. help boost customers in business. 11.i Can make you gain promotions at work place. 12. Help to make your admired partner to be yours.